Rooter Drain Expert Inc. in Saugus, California provides a full range of services to meet your plumbing system needs. Our trenchless pipe lining is highly popular, and carries a range of benefits for both commercial and domestic requirements! All Rooter Drain Expert services are designed to be minimally invasive and are performed with a much smaller degree of disturbance (i.e., mess and noise) in a shorter period of time than traditional methods. In this, our pipe lining services are no exception! Before any repairs begin, your pipe problem is assessed by a trained plumbing system engineer via a sewer camera inspection. This involves sending a small high-definition camera into your pipe to get footage in real time of the exact nature of your problem. This will allow the Rooter Drain Experts to diagnose the issue, pinpoint its location, and give you accurate feedback and options. Following a consultation, during which you are welcome to view the camera footage, the system engineer will let you know if trenchless pipe lining is right for you. Pipe lining is used in the case of corroded, shattered, or simply old pipe that is functioning poorly or not at all. It can be utilized for your entire plumbing or pipe system, or can be cut to fix a small section of pipe only. If proceeding with our trenchless service, a technician will first prepare the pipe for the liner using hydrojetting. This is essentially what it sounds like – a jet of water at high pressure, which will clear kitchen grease and debris from the pipe, and allow the liner to adhere cleanly. Next, a pipe liner, enforced with durable epoxy resin, is unrolled and fitted to the end of your pipe. Using high pressure, the liner is pushed inside-out and forced into the pipe. The newly installed pipe lining in reality functions as a brand-new pipe with a lifespan of up to fifty years! As it is epoxy-based, it will not rust or degrade in the way that traditional metals and plastics will, and its seamless construction means that no small fissures can form – perfect for Saugus, where you might encounter trees attempting to infiltrate your pipes using these small cracks. Additionally, the liner is highly flexible (literally), and can form to straight, curved, or 90-degree angle pipes. 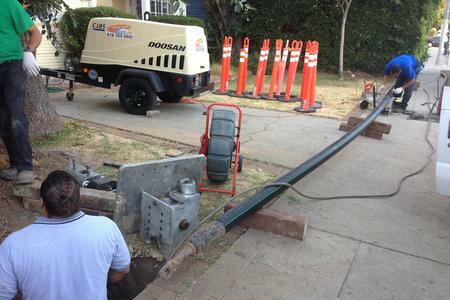 The “trenchless” aspect means that only a small access point is required to reach the pipe, in contrast to traditional methods which need a large trench or long hole – in your yard, under your foundation, or inside a wall – to reach and service your pipe system. Trenchless pipe lining is also much more environmentally friendly than traditional systems, as it doesn’t send sections of pipe or materials to a landfill. The original pipe stays in place, and the new liner (with its much longer lifespan) doesn’t require service as frequently, meaning even less waste is produced. Contact The Rooter Drain Experts today! If you’re having pipe problems, or simply want to plan for the future, contact us today! One of our knowledgeable plumbing system engineers will consult with you about potential services, costs, and what’s right for you!